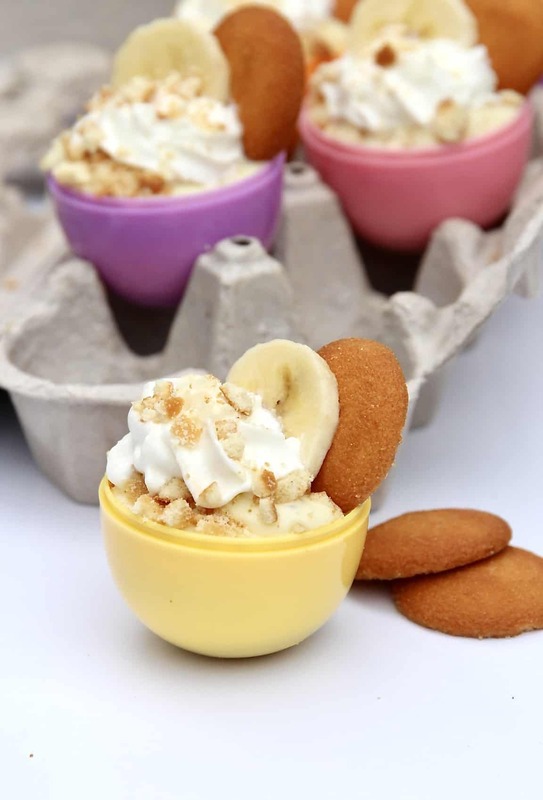 Easter Egg Banana Pudding Cups made with NILLA Wafers are an easy and adorable treat to celebrate Easter with! THIS POST HAS BEEN SPONSORED BY NILLA WAFERS. ALL THOUGHTS AND OPINIONS ARE MY OWN. THANK YOU FOR SUPPORTING THE BRANDS THAT MAKE THE BAKERMAMA POSSIBLE. Aren’t these the cutest little Easter desserts ever?! So simple yet so adorable and absolutely delicious. 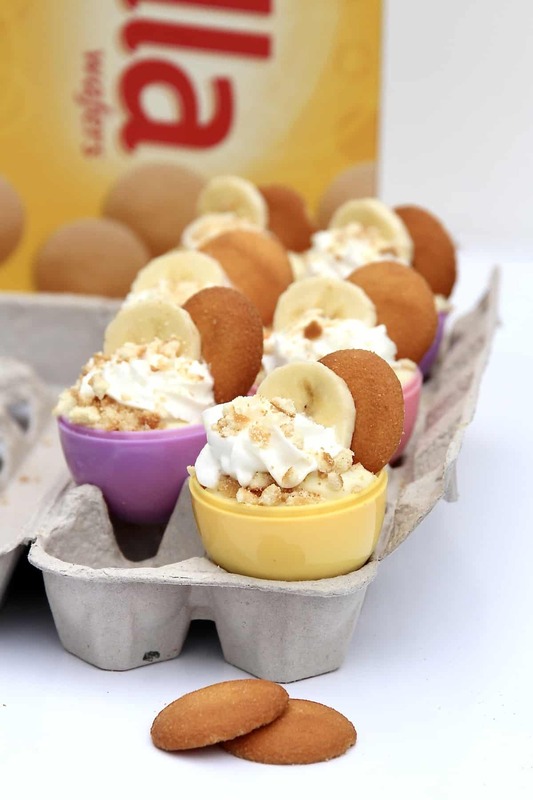 Everyone’s favorite NILLA Wafer banana pudding layered in individual egg cups are sure to be the talk of the Easter treats. A one-stop shop at Kroger is all it takes to get the simple ingredients needed to make these adorable Easter treats. NILLA Wafers, prepared vanilla pudding, fresh bananas, whipped topping and plastic Easter eggs keep the list short and sweet. I love how the 4-inch Easter egg halves are the perfect size for each person to enjoy their banana pudding in the most festive of ways. Just be sure to clean them first. 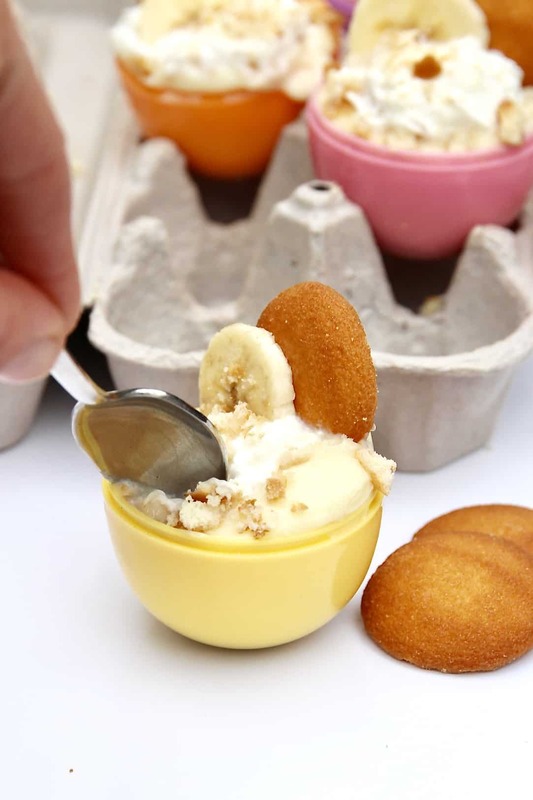 You can serve the banana pudding egg cups in an egg carton for extra festiveness or just on a platter as you’ll want to make sure you use the flat bottoms of the Easter eggs to layer the pudding in. Each egg holds two layers of NILLA Wafers, banana slices and vanilla pudding along with a dollop of whipped topping, crushed NILLA Wafers and a garnish of one more NILLA Wafter and a banana slice. Perfect portion and so easy to make, even the kiddos could make them on their own. 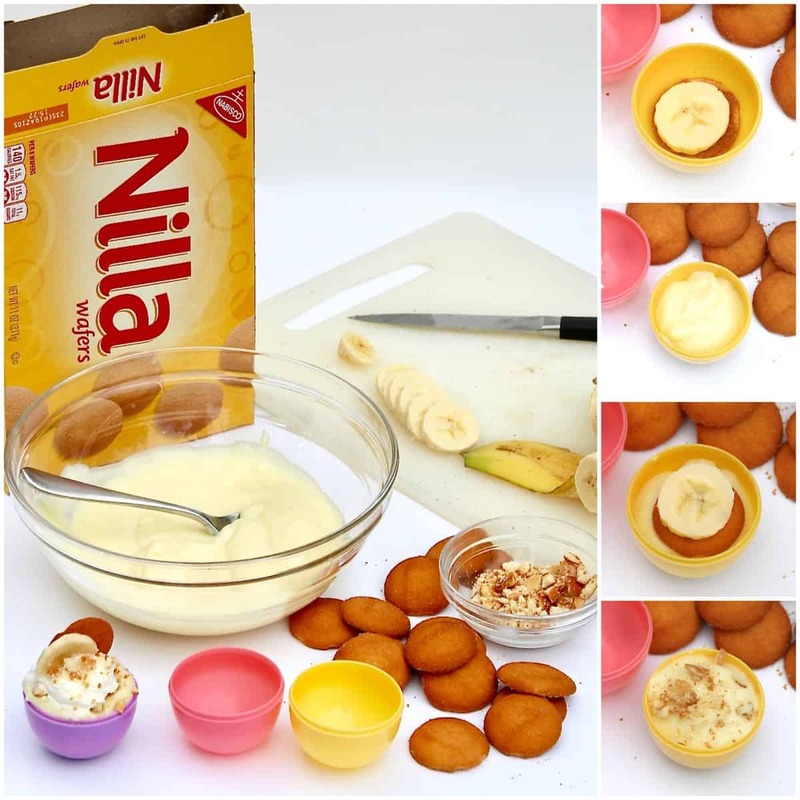 The way the crispy, vanilla-flavored NILLA Wafers and fresh banana slices soak in the vanilla pudding is just irresistible in both taste and texture. Everyone, young or old, loves this classic dessert! 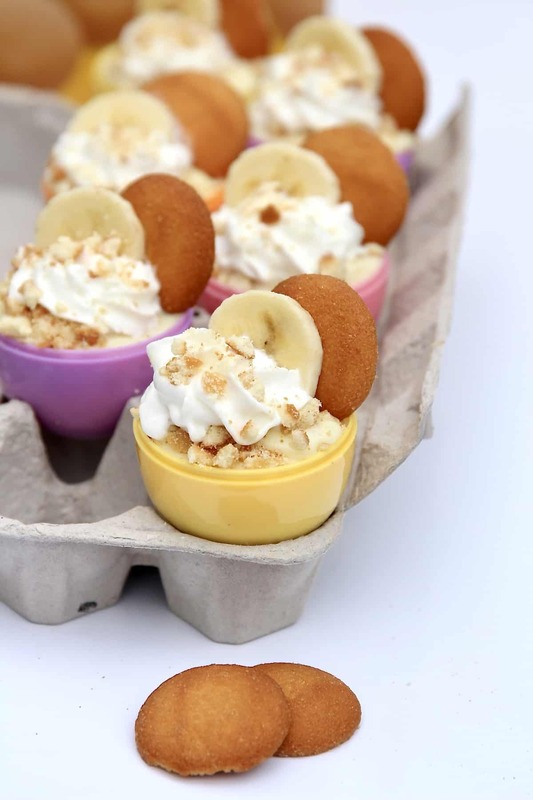 I’m so excited for y’all to up the cuteness this Easter with these Easter egg banana pudding cups. They’re obviously way more delicious than the typical candy you’d find in an egg during the big egg hunt. Using the bottom flattened halves of 16 (4-inch) plastic Easter eggs that have been cleaned first, layer the ingredients in this order: NILLA Wafer, banana slice, 1 tablespoon vanilla pudding, NILLA Wafer, banana slice, 1 tablespoon vanilla pudding, crumbles of half of a NILLA Wafer, 1 tablespoon whipped topping, crumbles of half of a NILLA Wafer. Repeat to fill all 16 egg halves. Refrigerate at least one hour or until ready to serve. 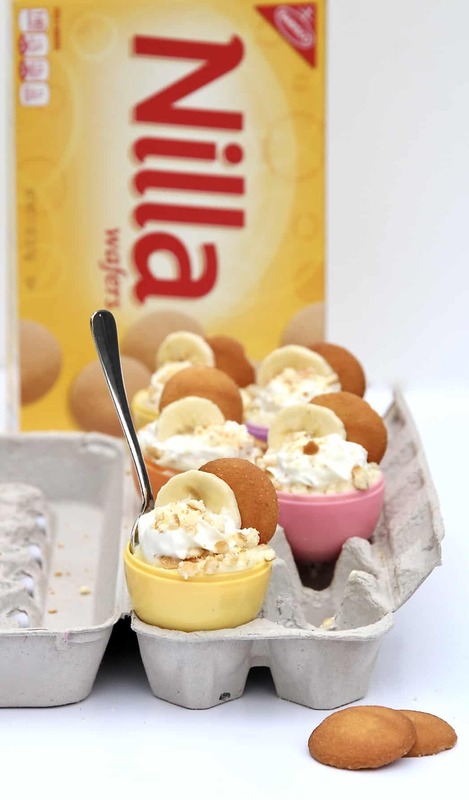 Just before serving, garnish each egg cup with NILLA wafer and sliced banana.